A quick weeknight protein-packed dinner, we serve this with brown rice but you could use any grain you’d like. 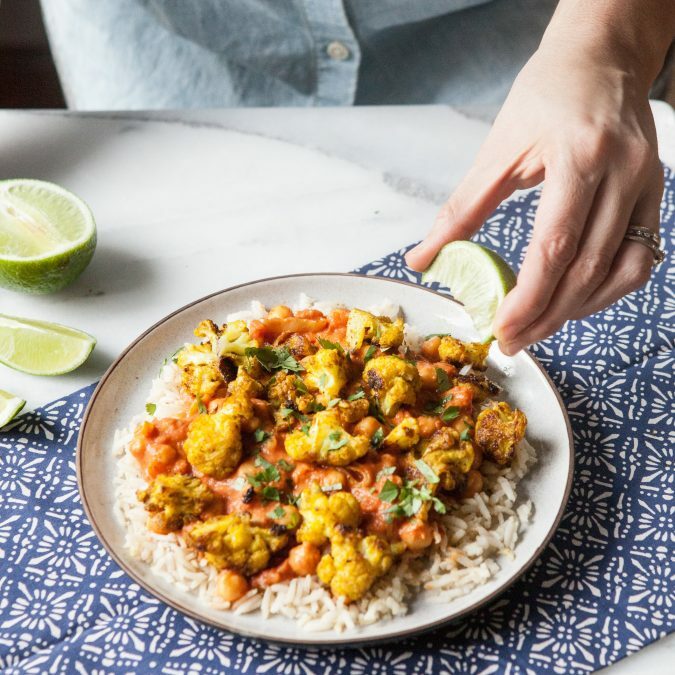 The Curried Cauliflower, all by itself, would be great to roast up to use for veggie tacos, salads or grain bowls throughout the week. If you can’t find fire-roasted tomatoes, regular crushed tomatoes will work just fine, and I happened to be out of harissa so I omitted it and the cauliflower was still delicious. Preheat the oven to 450F. Line a baking sheet with parchment paper and set aside. In a saucepan fitted with a steamer basket, add water to just below the bottom of the basket. Bring to a boil. Add the cauliflower, reduce the heat to medium, and cover to steam for 5 minutes. This will begin the cooking process. Remove the cauliflower, and place on the prepared baking sheet. In a small ramekin, stir together all of the remaining ingredients. Drizzle over the cauliflower and toss to evenly coat. Bake for 15 minutes. Stir and bake for 10-15 minutes more or until the cauliflower begins to char. Taste and sprinkle with the additional salt as needed. Heat a large saute pan over medium heat. Once the pan is warm, add the oil and onion. Saute until the onion is translucent, about 4 minutes. Sprinkle with 1/4 teaspoon salt. Add the garlic, and cook for 30 seconds more. Stir in the remaining salt, curry powder, cumin and cinnamon and cook for 1 minute more to toast the spices. Add the tomatoes and cream (If you prefer a smooth sauce, puree the tomato mixture in a blender and return to the pan). Add the chickpeas and simmer for at least 15 minutes over medium to allow the flavors to develop. Taste and add more of the seasonings if necessary. To serve: Divide the rice evenly amongst 4 bowls. Top evenly with the chickpea sauce. Top the the Curry Cauliflower, lime juice, dollop of yogurt, and cilantro, if desired.